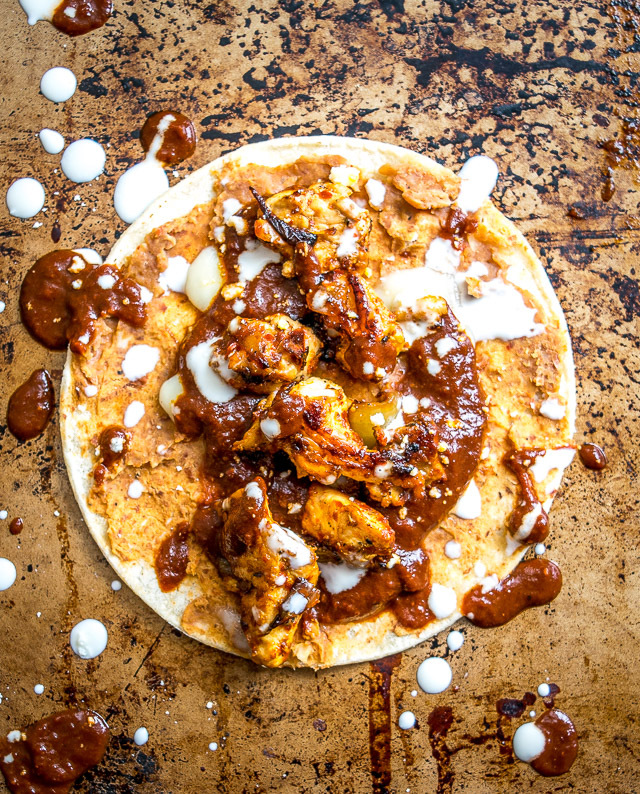 In addition to their unique, otherworldly flavor, these Colorado Chicken Tacos have some rebel in them. Most old school Mexican sauces rarely dip their toes in the taco pool, but this lively Colorado Sauce abhors rules and is bursting with an urgent need to be heard (eaten). A simple pairing with some chipotle infused refried beans will leave the old guard aghast and grasping for order, but it will be too late. Once you unleash this Colorado Sauce the possibilities become endless and your kitchen will never be the same. 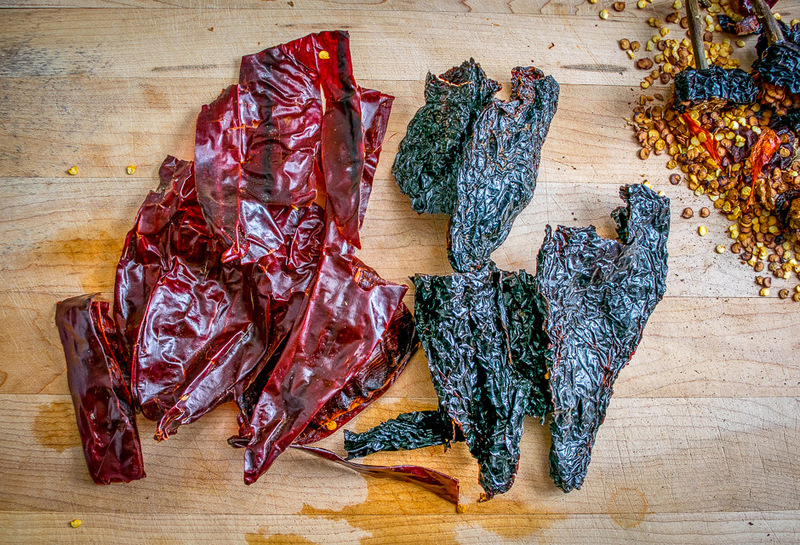 We’ll start with four New Mexican and three Ancho dried chiles. De-stem and de-seed the chiles, but don’t worry about getting every last seed out as it won’t affect the flavor too much. And if there are any dusty crevasses on the chiles you can wipe them off with a damp paper towel. If they float to the top you can use a small plate or bowl to keep them submerged. Meanwhile, saute 1/2 an onion and 3 whole cloves of garlic in a dollop of oil. Cook until the onion is just starting to brown, about 5-8 minutes. 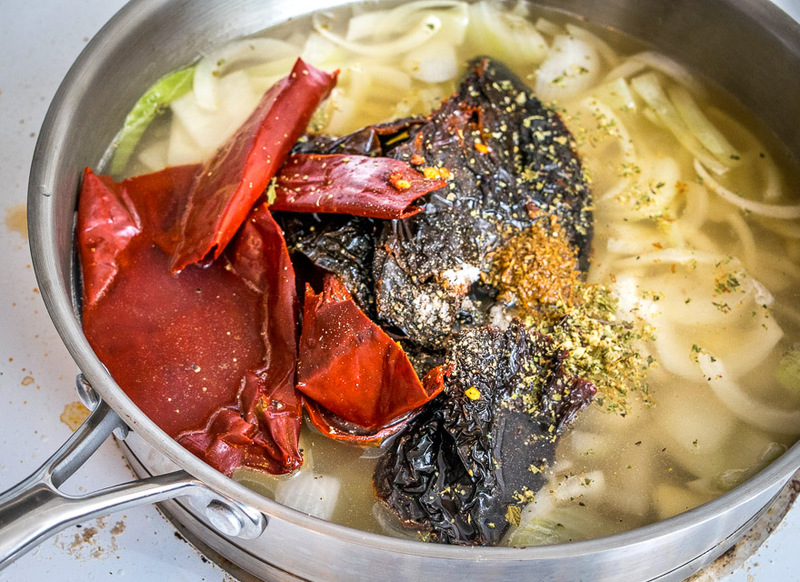 Drain the chiles and add to the onion mixture along with 3 cups of stock, 1/2 teaspoon cumin, 1/2 teaspoon oregano (use Mexican oregano if you have it), 1/2 teaspoon salt, and some freshly ground pepper. Note that we are making this sauce differently than last time. The recent Colorado Enchiladas reconstituted the chiles in the saute pan while the chicken cooked. Since we are cooking the chicken separately we aren’t going to reconstitute the chiles in the pan. You can simply add the drained chiles to the onion-stock mixture, bring everything up to a uniform temp, and then blend it together. And now the most important part: take a taste. If it’s slightly bitter than you know you are a candidate for some sauce sweetening in the next step. If it doesn’t taste bitter then you can consider the sweetening optional. One other thing to note about all this bitterness before we move on…. There are 7 billion different palates out there, all interpreting food differently. If your palate is sensitive to bitterness then the reconstituting method we used today is a good option for you, i.e. 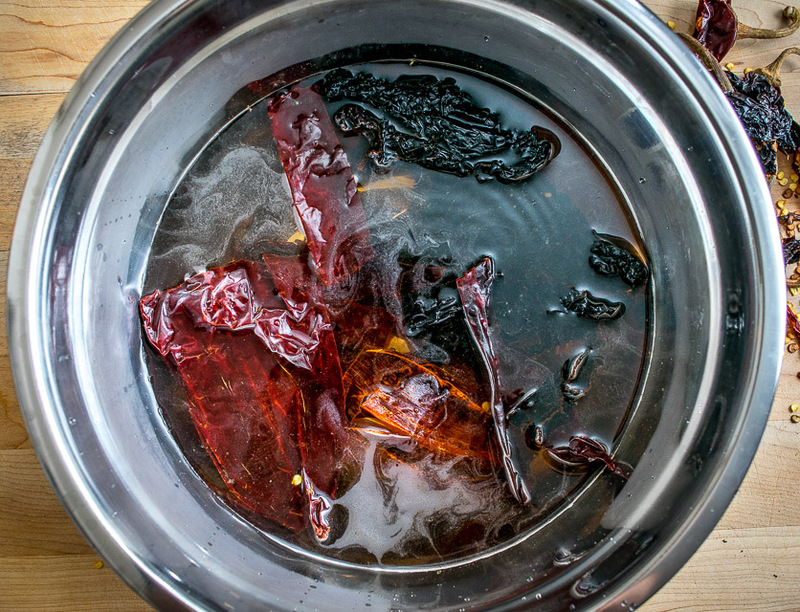 we drained the chiles and discarded the soaking liquid. 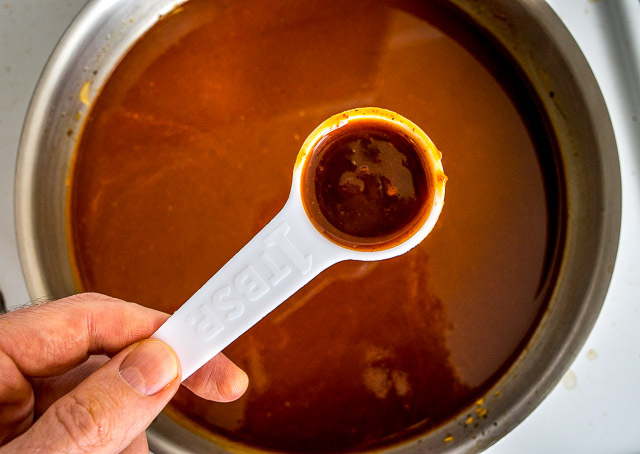 Some recipes will use the soaking liquid in the final sauce and this can actually enhance the earthiness (bitterness) of the sauce. Okay, strain the blender mixture through a fine mesh sieve. Push the sauce through using a spoon or spatula and you’ll be left with about half a cup of seeds and skin that can be discarded. Add the strained sauce back to the original saucepan on medium heat. 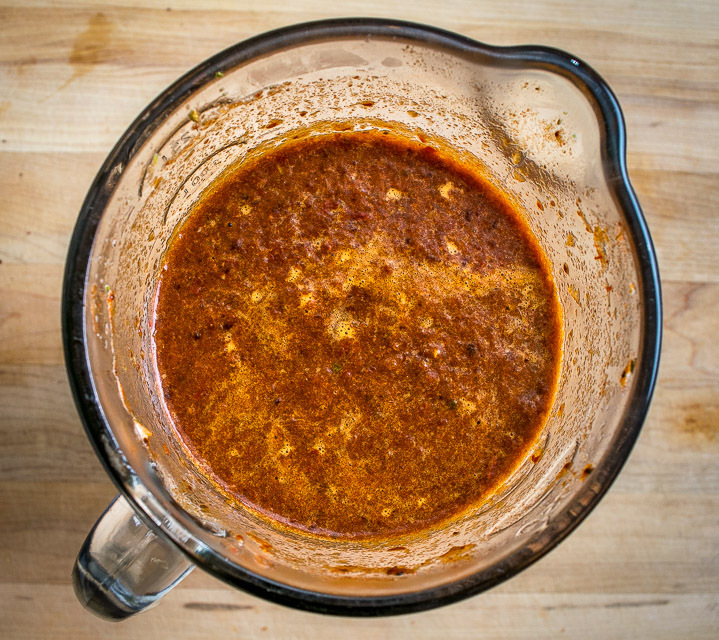 You’ll need about 15-30 minutes to reduce the sauce down to a thicker consistency. To complement the earthiness of the dried chilis, I’ve been adding one tablespoon of adobo sauce from a can of chipotles in adobo. And a sliver of dark chocolate. Stir well and take a taste. For me, just a hint of sweetness from the adobo and chocolate counters the chiles perfectly, and the result is a rich, complex sauce that is bursting with flavor. Feel free to add additional hints of adobo and chocolate if your palate calls for it. Sure, you can use a can of refried beans for these tacos, but you’ll get an instant upgrade if you make a quick batch yourself. I’ll put instructions for these beans in the recipe box below. It’s super easy, you are basically blending whole pinto beans with chipotles, onion, garlic and cumin. And if you are making chicken, don’t sweat the exact seasoning too much as the Colorado Sauce flavor will dominate. This batch is seasoned with salt, pepper, crushed New Mexican chiles, and then sauteed on medium heat with some slivers of onion. By now, the Colorado Sauce has reduced down and is itching to come to life. These tacos will taste best warm and with the tortillas slightly crunchy, so if possible build them a few at a time and eat them hot off the comal. Each taco gets a thin layer of refried beans and plenty of cheese. Cook over medium-high heat. Once the cheese is melted bring these beauties to the table and build them up with the chicken and Colorado Sauce. Of course, a little Crema and Cotija cheese never hurts so consider these worthy, but optional, garnishes. I’ve also tried these Colorado Chicken Tacos with traditional fixings like guacamole but I didn’t like it. I think it’s because the Colorado Sauce has such a dominant flavor and anything that competes with it too much is just in the way. Kids these days…. P.S. Here are the 27 Mexican recipes you can make all from keeping a simple pantry list on hand. 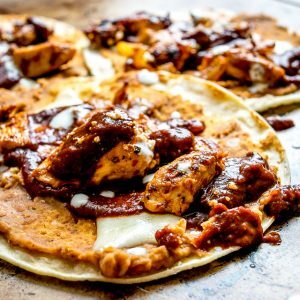 Ancho and New Mexican dried chilis create a delicious Colorado Sauce that's served up taco style with chipotle infused refried beans and grilled chicken. De-seed and de-stem the dried chiles. Wipe off any dusty crevasses. Add the chiles to a bowl and cover with hot tap water. Let reconstitute for 15-30 minutes. You can cover them with a small bowl or plate to keep them submerged. Saute 1/2 an onion and 3 garlic cloves in a dollop of oil over medium heat. Cook until just starting to brown, approximately 5-8 minutes. Drain the chilis and add to the onion mixture along with 3 cups of stock, 1/2 teaspoon of oregano, 1/2 teaspoon cumin, 1/2 teaspoon salt, and some freshly ground pepper. Let cook for a couple minutes or until everything is at a uniform temp. Add to a blender and combine well. Take a taste. If it tastes bitter you know you'll want to sweeten it up a bit. 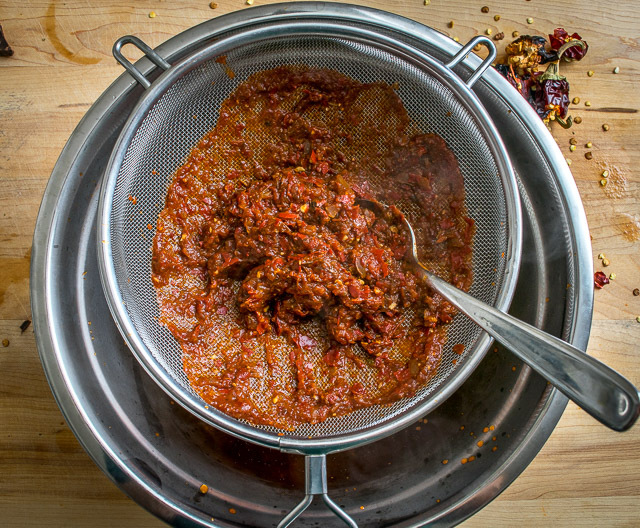 Strain the sauce through a fine mesh sieve, pushing it through with a spoon or spatula. Discard leftover solid remnants. Add strained sauce back to the saucepan. 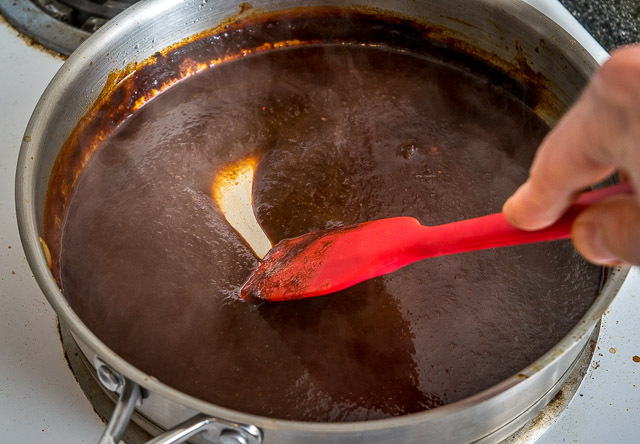 Add 1 Tablespoon adobo sauce and a sliver of dark chocolate to balance the earthiness of the sauce. Let cook over mediumish heat until the sauce clings to a spatula, approximately 15-30 minutes. If you are making refried beans, start by sauteing 1/2 an onion and 2 garlic cloves in a dollop of oil for a few minutes. 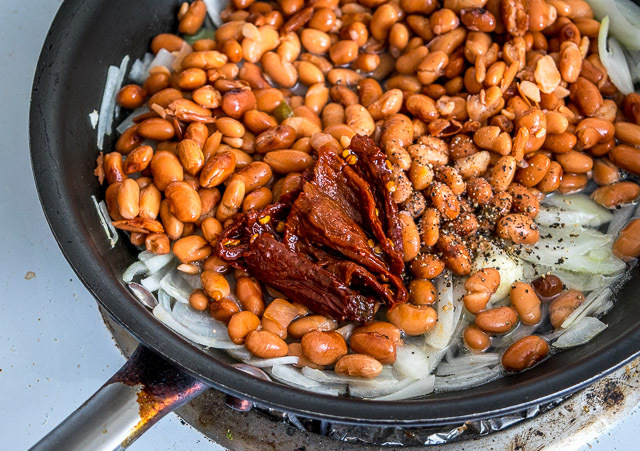 Drain and rinse a can of pinto beans and add to the onion mixture along with 2 chipotles in adobo, 1/2 cup stock (or water), 1/2 teaspoon cumin, 1/4 teaspoon salt, and some freshly ground pepper. Bring this bean mixture to a uniform temp and then add to a blender and combine well. Return bean mixture to saucepan and cook over medium-low heat until you have a thicker consistency, approximately 5-10 minutes. Saute 2-3 Tablespoons of chopped onion in a dollop of oil over medium-high heat. Add the chicken pieces and form a single layer. Once the first side is mostly cooked through flip and cook the other side for an additional 2-3 minutes or until it's done. Set aside in a bowl until needed. 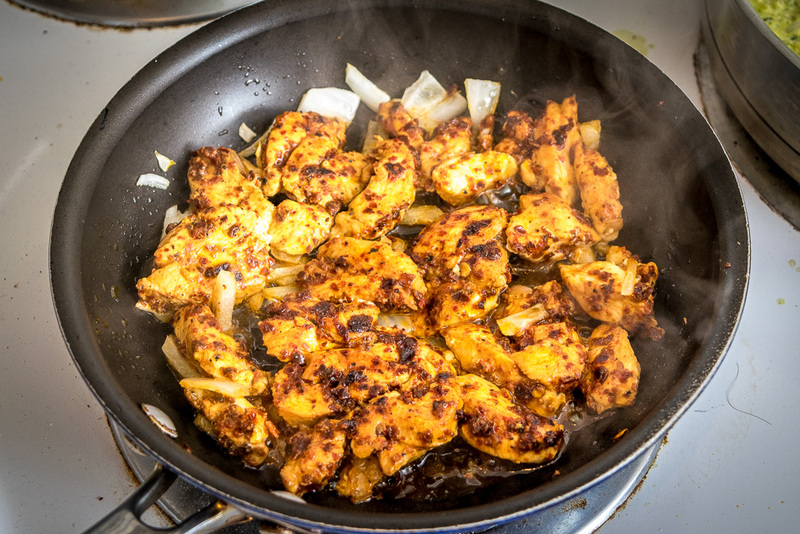 Heat a comal or skillet to medium-high temperature. Each tortilla gets a thin layer of beans and plenty of cheese. I usually cook them three at a time on the comal. 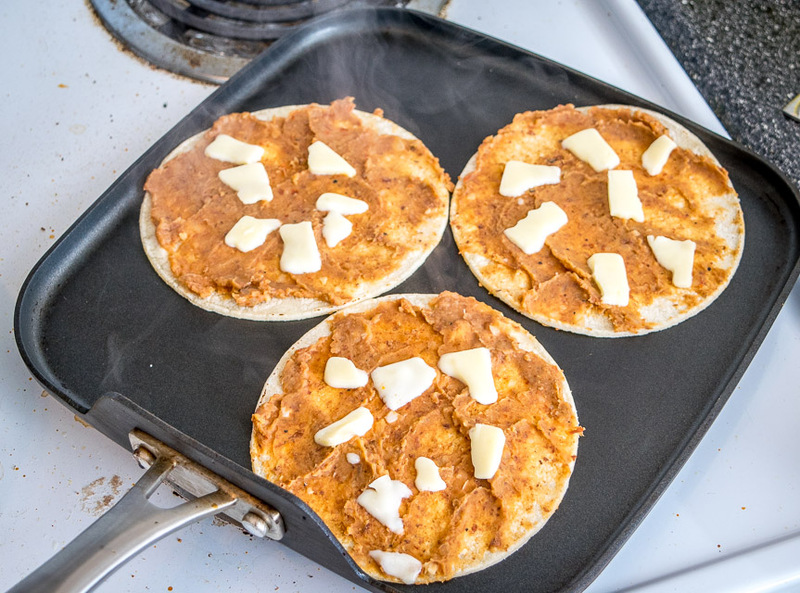 Cook until the cheese is melted or until the underside of the tortilla is getting crunchy and forming brown spots. Serve immediately and top with chicken, Colorado Sauce, and your choice of garnishes. You'll find cans of chipotles in adobo sauce in the Latin goods section of most grocery stores. I used one of the larger 20 oz. cans of pinto beans for the refried beans. You can ease up on the ingredients if you are using a smaller can. Like this dish? 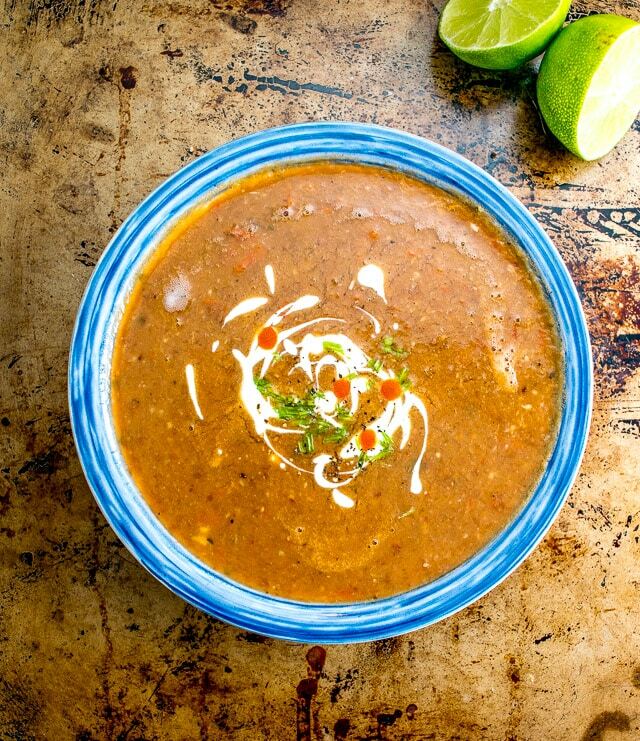 You’ll find similar flavors in our Pinto Bean Soup. And if you want to see a list of authentic Mexican entrees you can make tonight, click here. The tacos look legit man! I plan on making these some time. OMG, Patrick, this sauce looks amazing. I rarely made Mexican sauces, usually purchase store bought ones or the convenience. When I have some time I look forward to making this sauce recipe! Those are probably the most beautiful tacos I’ve ever seen! Thanks Jeff! Great to see you! Awesome, glad you made these Rod! Now that I’ve seen your site, hope to try a beef version soon. … with a touch of “well balanced” Pico would be a plus. Thank you Patrick for sharing. Great recipe and great website! Keep those recipes coming! Thanks much for the feedback George! Glad the recipe worked out for you. I’ve made this maybe 5 times now and have made a few changes. Yes, it’s bitter. But use an entire 40g piece of Mexican chocolate and it’s amazing. Simple mole. Great on pork tamales… in fact that was our dinner! Awesome, thanks much for your notes George, so helpful for me and for all future readers! 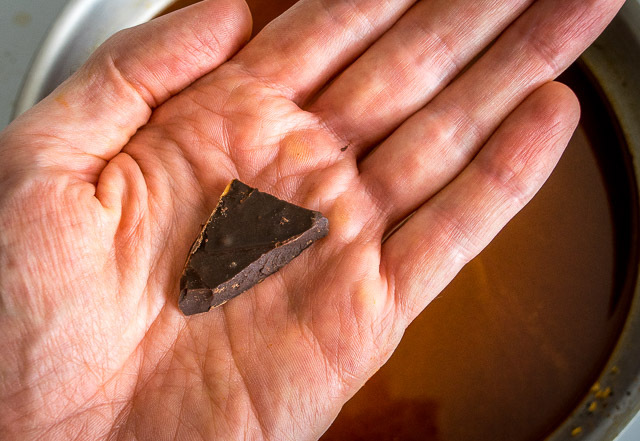 I think I am less tolerant of bitter notes so I usually toss the soaking water/stock, but good to know that you are having success using it as I know there are loads of people out there who crave that earthy flavor. Cheers. P.S. Would love to try this on pork tamales, thanks for the inspiration!